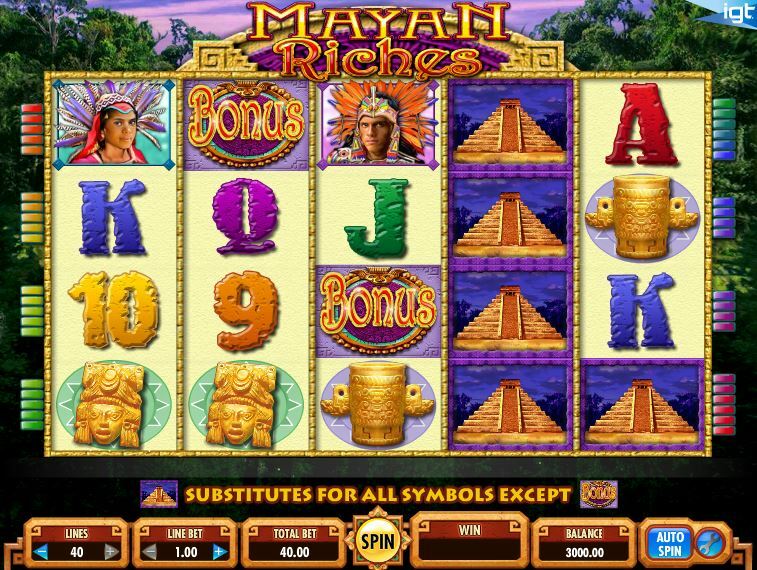 Designed by IGT, Mayan Riches is of course themed around the Mayans, long lost now, but a very powerful and impressive civilization in South America before it crumbled. These civilizations are often used as inspiration, especially since you have things like temples to explore, with potential huge riches to be found inside. 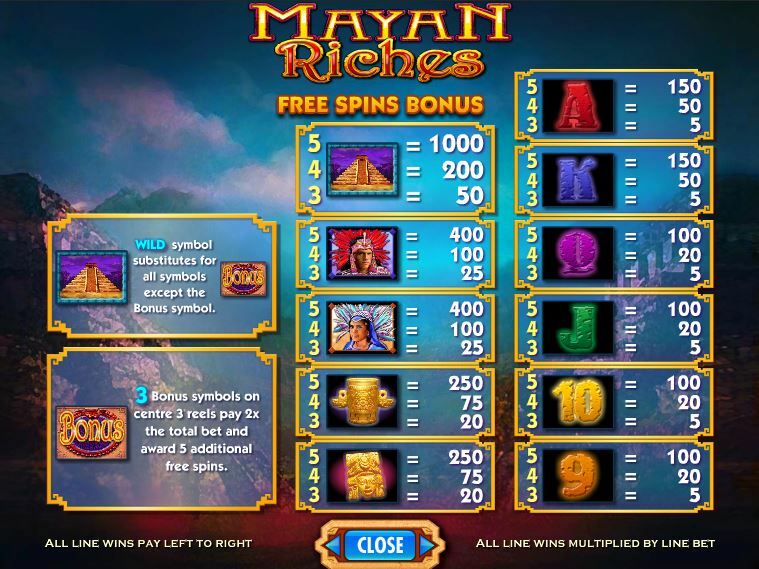 At least that’s the idea that slot developers are trying to sell us, that the Mayans left behind huge treasures, and that their slots give you a shot at prizes that are comparable in value. 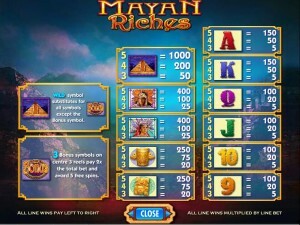 40 bet lines are available for betting purposes in Mayan Riches, a game that has 5 reels and four symbols on each one. 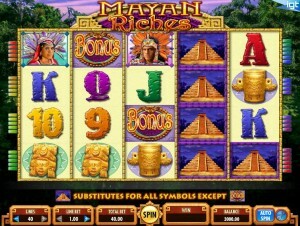 You get free spins, but not too many of them, plus a wild symbol. The largest possible prize of the game is worth $50,000. It’s a rather bland game when it comes to available features. While they are available, it’s hard to be impressed these days with a wild symbol and a bonus icon which gives you only 5 free spins. First, let’s take a look at the wild feature. The image which was chosen to represent it shows you a Mayan Pyramid, one of the big mysteries left behind by this civilization. As a wild, the symbol can appear anywhere on a payline, and if some of the symbols are matching regular icons it takes the same role and helps them form their own combo. A wild will not substitute for a bonus symbol though. If multiple wilds land together on a line, from left to right, they form a combo and pay up to 1,000x. 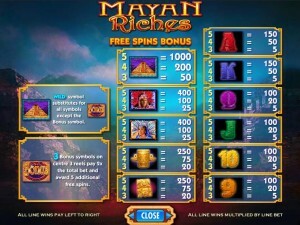 The slot’s free spins are triggered when the Bonus icon is present on the reels 2, 3 and 4 simultaneously. These are scatters, so they can be in any position. You get a small prize, 2x the triggering bet, plus 5 free spins. If you get the three bonus icons again, you obtain an additional 5 free spins. You are allowed to change both the number of lines and the line bet. Up to 40 lines are selectable, while the minimum line bet is worth $1. With all the lines active, the smallest wager is worth $40. The largest one is at $2,000, using $50 coins. The game has a top payout of 1,000x to offer, obtained with the help of five wilds arranged on the same payline. If the largest possible coin was used, you can win $50,000 cash. It’s not a lot of money though, not when you consider the maximum bet of $2,000. The game has some decent symbols in it, but there are some that look quite old as well. I’m not sure how recent this slot is, but the feeling is that it’s one of their older titles. The playing cards look like they’re made out of stone, but they have different colors, and none of them look natural. There are also items made out of gold, a couple of Mayans and the famous pyramids they left behind. Overall, I’m not impressed with the design, and you should have no problem finding slots with the same theme that look a lot better. Symbols: Pyramid (wild, 1,000x), Bonus (scatter), Mayan Warrior (400x), Mayan Princess (400x), Gold Vessel (250x), Gold Idol (250x), Ace (150x), King (150x), Queen (100x), Jack (100x), 10 (100x) and 9 (100x). The theme choice is a very common one, the slot doesn’t pay a lot and the number of features is very limited. Overall, it’s not the kind of game you want to play in the long run. 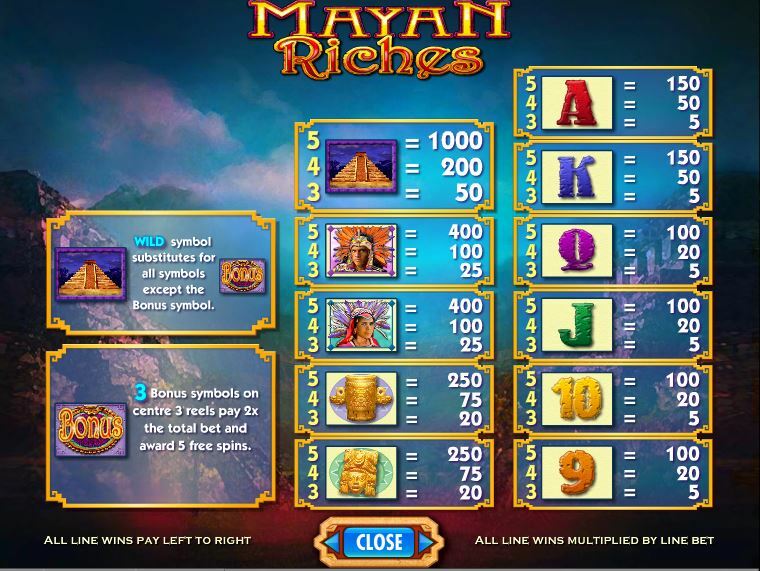 You will find Mayan Riches at any online casino which chooses to use software from IGT, playable either for free or for real money.